^ a b c d e f g h Silva, Robert J. (2006). “Fermium, Mendelevium, Nobelium, and Lawrencium”. In Morss, Lester R.; Edelstein, Norman M.; Fuger, Jean (PDF). The Chemistry of the Actinide and Transactinide Elements. 3 (3rd ed.). Dordrecht: Springer. pp. 1621–1651. doi:10.1007/1-4020-3598-5_13. http://radchem.nevada.edu/classes/rdch710/files/Fm%20to%20Lr.pdf. ^ Choppin, G. R.; Harvey, B. G.; Thompson, S. G. (1956). “A new eluant for the separation of the actinide elements”. J. Inorg. Nucl. Chem. 2 (1): 66–68. doi:10.1016/0022-1902(56)80105-X. ^ a b c d e f Ghiorso, Albert (2003). “Einsteinium and Fermium”. Chemical and Engineering News 81 (36). http://pubs.acs.org/cen/80th/einsteiniumfermium.html. ^ a b Ghiorso, A.; Thompson, S.; Higgins, G.; Seaborg, G.; Studier, M.; Fields, P.; Fried, S.; Diamond, H. et al. (1955). “New Elements Einsteinium and Fermium, Atomic Numbers 99 and 100”. Phys. Rev. 99 (3): 1048–1049. Bibcode: 1955PhRv...99.1048G. doi:10.1103/PhysRev.99.1048. 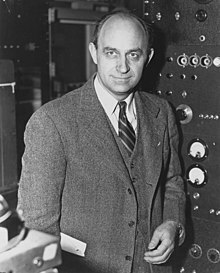 ^ Fields, P. R.; Studier, M. H.; Diamond, H.; Mech, J. F.; Inghram, M. G. Pyle, G. L.; Stevens, C. M.; Fried, S.; Manning, W. M. (Argonne National Laboratory, Lemont, Illinois); Ghiorso, A.; Thompson, S. G.; Higgins, G. H.; Seaborg, G. T. (University of California, Berkeley, California): "Transplutonium Elements in Thermonuclear Test Debris", in: Fields, P.; Studier, M.; Diamond, H.; Mech, J.; Inghram, M.; Pyle, G.; Stevens, C.; Fried, S. et al. (1956). “Transplutonium Elements in Thermonuclear Test Debris”. Physical Review 102: 180. Bibcode: 1956PhRv..102..180F. doi:10.1103/PhysRev.102.180. ^ Luig, Heribert; Keller, Cornelius; Wolf, Walter; Shani, Jashovam; Miska, Horst; Zyball, Alfred; Gerve, Andreas; Balaban, Alexandru T. et al. (2000). Radionuclides. doi:10.1002/14356007.a22_499. ^ Porter, C. E.; Riley, F. D., Jr.; Vandergrift, R. D.; Felker, L. K. (1997). “Fermium Purification Using Teva Resin Extraction Chromatography”. Sep. Sci. Technol. 32 (1-4): 83-92. doi:10.1080/01496399708003188. ^ Sewtz, M.; Backe, H.; Dretzke, A.; Kube, G.; Lauth, W.; Schwamb, P.; Eberhardt, K.; Gruning, C. et al. (2003). “First Observation of Atomic Levels for the Element Fermium (Z = 100)”. Phys. Rev. Lett. 90 (16): 163002. Bibcode: 2003PhRvL..90p3002S. doi:10.1103/PhysRevLett.90.163002. ^ Hoff, R. W.; Hulet, E. K. (1970). Engineering with Nuclear Explosives. 2. pp. 1283-1294. ^ Choppin, G. R.; Harvey, B. G.; Thompson, S. G. (1956). “A new eluant for the separation of the actinide elements”. J. Inorg. Nucl. Chem. 2 (1): 66-68. doi:10.1016/0022-1902(56)80105-X. ^ Mikheev, N. B.; Kamenskaya, A. N.; Konovalova, N. A.; Rumer, I. A.; Kulyukhin, S. A. (1983). “High-speed method for the separation of fermium from actinides and lanthanides”. Radiokhimiya 25 (2): 158-161. ^ Lundqvist, Robert; Hulet, E. K.; Baisden, T. A.; Nasakkala, Elina; Wahlberg, Olof (1981). “Electromigration Method in Tracer Studies of Complex Chemistry. II. Hydrated Radii and Hydration Numbers of Trivalent Actinides”. Acta Chem. Scand., Ser. A 35: 653-661. doi:10.3891/acta.chem.scand.35a-0653. ^ Hussonnois, H.; Hubert, S.; Aubin, L.; Guillaumont, R.; Boussieres, G. (1972). Radiochem. Radioanal. Lett. 10: 231-238. ^ Thompson, S. G.; Harvey, B. G.; Choppin, G. R.; Seaborg, G. T. (1954). “Chemical Properties of Elements 99 and 100”. J. Am. Chem. Soc. 76 (24): 6229-6236. doi:10.1021/ja01653a004. ^ Mikheev, N. B.; Spitsyn, V. I.; Kamenskaya, A. N.; Gvozdec, B. A.; Druin, V. A.; Rumer, I. A.; Dyachkova, R. A.; Rozenkevitch, N. A. et al. (1972). “Reduction of fermium to divalent state in chloride aqueous ethanolic solutions”. Inorg. Nucl. Chem. Lett. 8 (11): 929-936. doi:10.1016/0020-1650(72)80202-2. ^ Hulet, E. K.; Lougheed, R. W.; Baisden, P. A.; Landrum, J. H.; Wild, J. F.; Lundqvist, R. F. (1979). “Non-observance of monovalent Md”. J. Inorg. Nucl. Chem. 41 (12): 1743-1747. doi:10.1016/0022-1902(79)80116-5. ^ Maly, Jaromir (1967). “The amalgamation behaviour of heavy elements 1. Observation of anomalous preference in formation of amalgams of californium, einsteinium, and fermium”. Inorg. Nucl. Chem. Lett. 3 (9): 373-381. doi:10.1016/0020-1650(67)80046-1. ^ Mikheev, N. B.; Spitsyn, V. I.; Kamenskaya, A. N.; Konovalova, N. A.; Rumer, I. A.; Auerman, L. N.; Podorozhnyi, A. M. (1977). “Determination of oxidation potential of the pair Fm2+/Fm3+”. Inorg. Nucl. Chem. Lett. 13 (12): 651-656. doi:10.1016/0020-1650(77)80074-3. ^ Samhoun, K.; David, F.; Hahn, R. L.; O'Kelley, G. D.; Tarrant, J. R.; Hobart, D. E. (1979). “Electrochemical study of mendelevium in aqueous solution: No evidence for monovalent ions”. J. Inorg. Nucl. Chem. 41 (12): 1749-1754. doi:10.1016/0022-1902(79)80117-7. ^ Koch, Lothar (2000). Transuranium Elements, in Ullmann's Encyclopedia of Industrial Chemistry. Wiley. doi:10.1002/14356007.a27_167.